This is my 120th bento post, and that means it is time to donate to my favorite local charity: Redwood Empire Food Bank! For every 20 posts, I donate 20 bucks to the Redwood Empire Food Bank. That's a dollar per post. I like to think that my lunches are helping other people in my community enjoy a healthy meal as well. I was inspired to donate a dollar per post after seeing the wonderful example set by Susan Yuen of Hawai'i's Bento Box. She donates to her local food bank. Debra of Hapa Bento also makes donations for each bento post. We are a supportive community of bloggers, and it is great to see us making an effort to help others. I encourage you to find a charity you like and make a donation per post, or you can make a donation to the Redwood Empire Food Bank. For every dollar Redwood Empire Food Bank gets, they distribute $4 worth of food! They are very efficient. Today's bento includes a char sui bao from Trader Joes topped with three nori hearts, a few baby carrots, steamed edamame, and fried rice with onion and carrots. I can't wait to go to the farmers market this weekend. I totally need to get more bento ingredients. This morning I ran into dragonmamma at the grocery store! It was so fun to meet someone from the bento world in person. I know dragonmamma doesn't do bento so much, but she does have a fun blog and is in the midst of a fun 365 challenge: breaking a routine everyday. She's breaking habits left and right, and building new synapses along the way. It's really fun and inspiring, be sure to check it out. 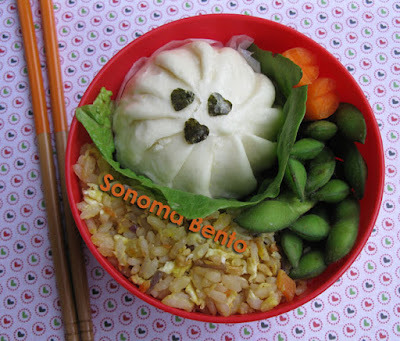 Have a great day, bento pals! And congrats on $120! Making it really count. Hope to run into YOU at the market one day too! Danke sehn, Token! Es hat auch gut geschmeckt! When I got home from the store, I told my husband "I just ran into a celebrity at Grocery Outlet! Michelle, the Sonoma Bento blogger" and he asked me "What kind of food was she buying?" Hah! I totally didn't notice. I was just excited to meet you. Thanks Susan! I love your cute bentos. Hi dragonmamma! I told my hubby that I met you too! It's so fun to meet online friends in real life. I'd love to have you come over once I get more settled in my new place. We can make Grocery Outlet bentos. Ha ha!